Add some elevation to your guns with these targeted bicep moves. The fact that some people develop longer, more football shaped biceps, while others develop shorter, more mountain-like biceps is mostly a matter left up to genetics. But do not fear, because there's a way that everyone can create the illusion of having a more substantial biceps peak. The key lies in bringing about greater development in a little-discussed muscle that sits underneath the biceps called the brachialis. In a highly defined bodybuilder, the brachialis appears as a thick “knot” of muscle that pops out of the side of the upper arm when they are flexed and viewed from the rear. 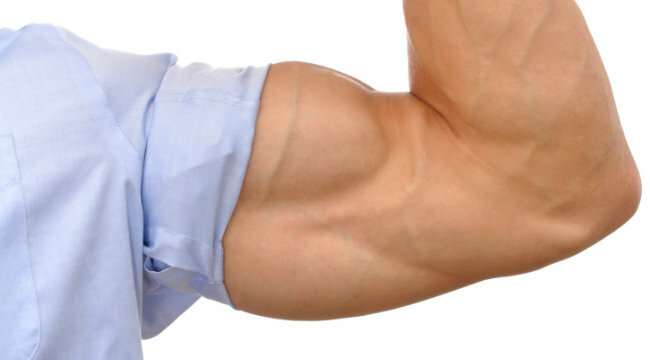 The cool thing about the brachialis is that as it grows larger, it will actually “push” the biceps up higher, which will give the appearance of a greater peak. The problem with effectively stimulating the brachialis is that with most standard curling movements the biceps act as the main flexor of the upper arm. You need to choose specific curling exercises that put the biceps in a mechanically weak position, so that the brachialis can get into the game! The more work you can force the brachialis to take on, the more it will be forced to adapt and grow. These are performed just like regular barbell curls with the only exception being that the palms are facing down. The palms down position will force the brachialis and the brachioradialis of the forearm to work intensely during this movement. Make sure you keep your elbows locked into your sides, and wrists straight throughout the set. With this movement you will be curling off of the vertical, not angled, side of a preacher bench. Load up a barbell with only about 60-70% of your normal preacher curl weight. Position yourself over the bench in such a manner that your armpits are snugly pressed into the top. Grab the weight and allow your arms to hang straight down. This unique exercise is my personal favorite for a targeted assault on the brachialis. Place a flat bench in front of a weight stack on one side of a cable crossover machine. Make sure that the bench is at least a foot or so away from the stack. Attach a short straight bar to the upper pulley, lie down, and plant your feet firmly on the floor. Have someone hand you the bar. Start with your arms perfectly straight and then begin curling the bar both down and back, so that at the full contraction point, the bar is actually behind your head. As you curl you will need to draw your elbows back slightly and tip your head forward just a bit in order to achieve this exaggerated range of motion. At the bottom hold the squeeze for a count and then return the bar under control to the starting position.